Barcelona: Etihad Airways CEO Tony Douglas announced plans to offer its customers better optionality, on the sidelines of an event in Spain on Wednesday to celebrate the airline’s inaugural flight to Barcelona. 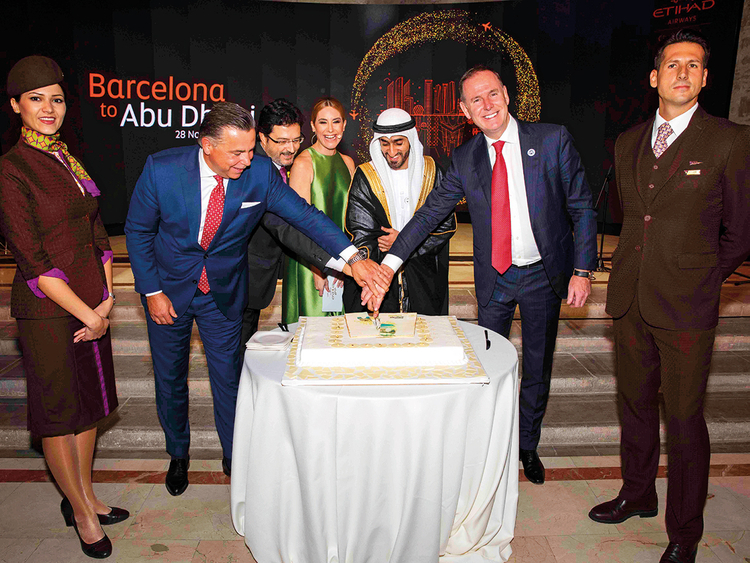 “Etihad prides itself on being different by trying to provide optionality,” Douglas told guests at the reception, held in the historic Capella dels Angels. ”You may want to fly in an economy seat, check in with additional legroom, or maybe select a premium meal offer from business class, or pick the pyjamas from first class, take extra baggage allowance, or have a limousine service. If that’s your choice by definition, your choice is a good choice. “Equally, if you want to take the lowest costs possible by de-selecting all the things you don’t want, that would be your choice as well and that would be a good choice. Etihad will now fly direct from Abu Dhabi to Barcelona five times a week, except Tuesdays and Thursdays, before going daily from March 31. It is the Abu Dhabi airline’s second new route launch of the year after Baku in Azerbaijan, in March. “Today, it’s 31 degrees in Abu Dhabi and pretty much like that all the way through until the end of April,” Douglas added. “So, when Europe is off season we are in season.